The holidays are fast approaching which means lots of entertaining and pot luck events. Instead of heading to the grocery store every day during the holidays, especially a few days before Thanksgiving I like to stock up on essential baking items that I know I can create beautiful desserts and snacks. 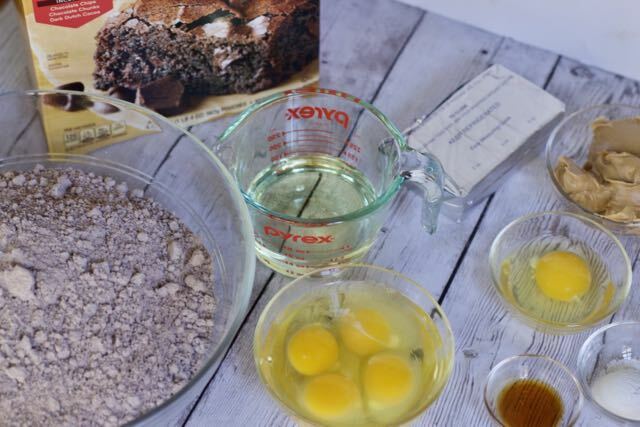 Brownie mix is one of the most versatile baking mixes out there. 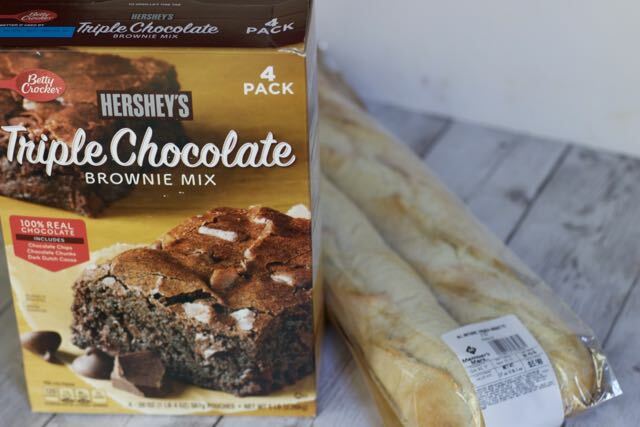 We especially like the Hershey’s Triple Chocolate Brownie Mix from Sam’s Club. 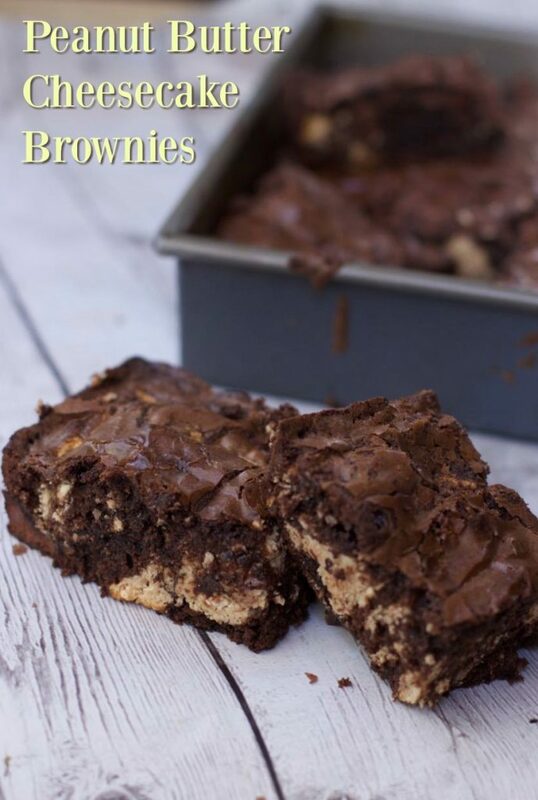 You can make a ton of desserts with boxed brownie mixes. 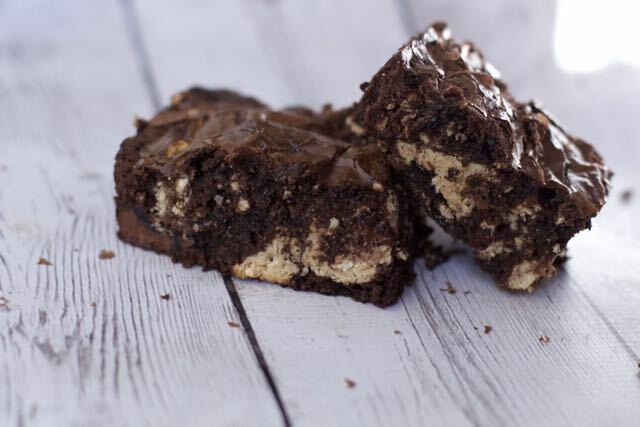 One of our favorites are swirled cream cheese brownies. 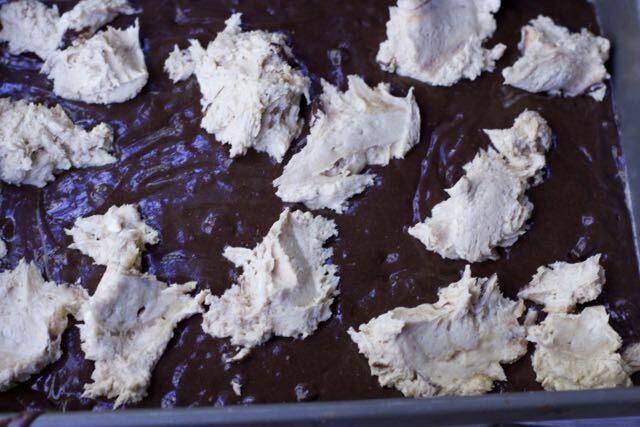 Well this week we decided to take a traditional cream cheese swirled brownie recipe and make it more decadent with Peanut Butter cheesecake batter. Two of my favorite flavor combinations, peanut butter and chocolate. Anyone else with me on this? 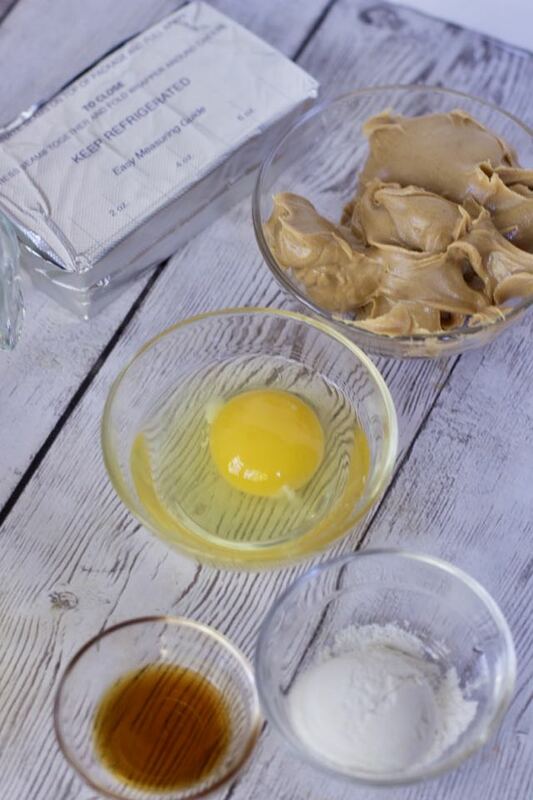 Since you are starting with a brownie mix, the only other ingredients you will need are cream cheese, eggs, sugar, vegetable oil and peanut butter. This is a two bowl dessert that will make your friends think you bought them at a bakery! 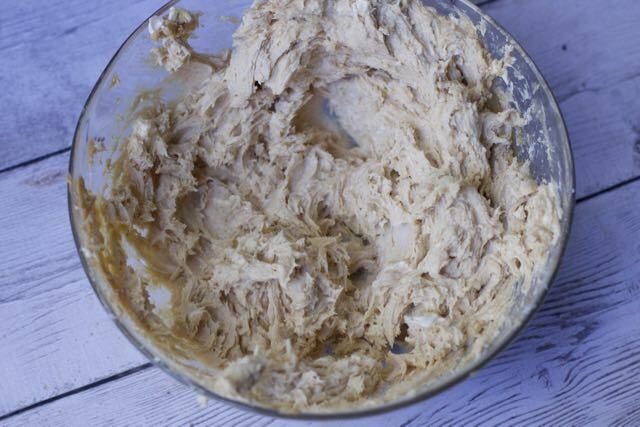 In a separate bowl, combine the ingredients for the peanut butter cream cheese swirled topping. Add about half of the batter, then the cheesecake mixture. Pour the remaining batter over the cheesecake and swirl the two with a knife. Unlike a traditional swirled brownies, these will be more swirled in the middle. Bake and wait for the magic flavors of chocolate and peanut butter to fill up your kitchen (I hope you have guests during this as their mouths will be drooling!). Other items I like to stock up when I am at Sam’s Club is the Member’s Mark French Bread. This bread freezes so well and I would have dug into it in the car as the fresh baked smell is oozing out of the bag! It makes great Garlic Bread, a serving vessel for bruschetta or a yummy addition to a panzanella Salad. 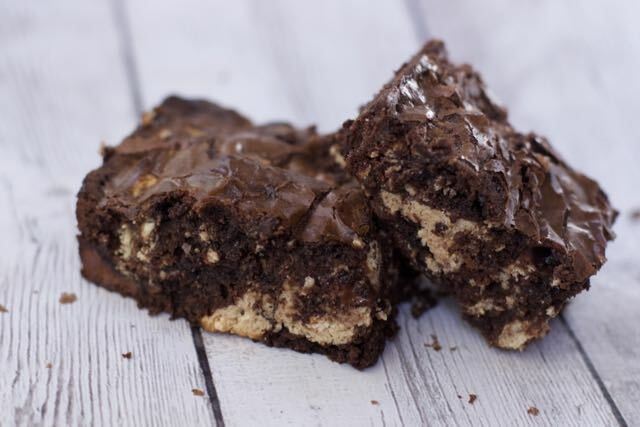 Find this Peanut Butter Cheesecake Brownies recipe and more at Sam’s Club. Preheat your oven according to package directions. Prepare brownie mix in a bowl according to package directions and set aside. Pour about 1/2 of your brownie batter into a 9x13 pan sprayed with nonstick spray. Spoon the cream cheese mixture on top of the brownie batter. Spoon the remaining brownie batter on top of the cheesecake mixture. 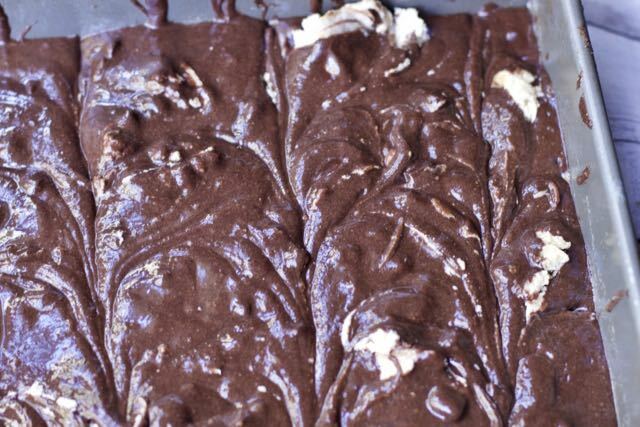 Use a knife to swirl the cream cheese and brownie batter together to create a marbled effect. Bake in preheated oven for 35-40 minutes or until a toothpick inserted near the middle comes out clean. Oh, my these look heavenly. My kids love to make brownies. These would be a nice twist. So true, and if you don’t like peanut butter just omit that from the cream cheese filling! 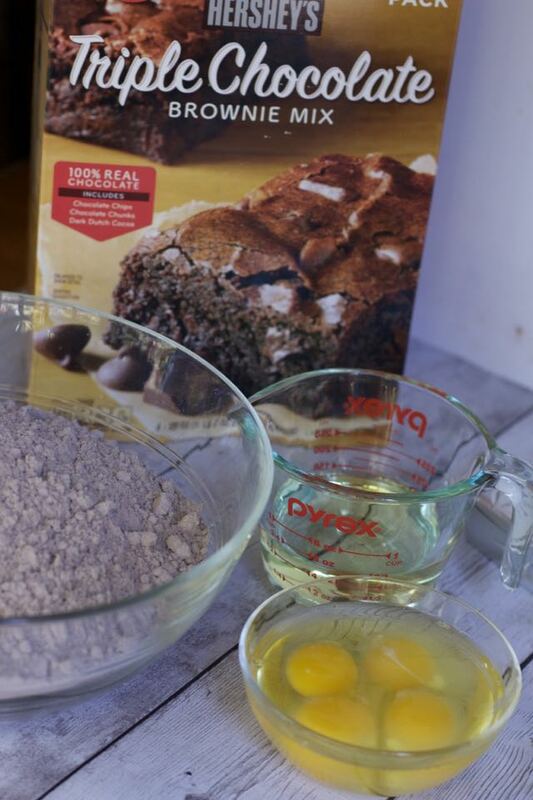 I love how easy this is to jazz up boxed brownie mix. Besides, isn’t everything better with peanut butter? This peanut butter cheesecake brownies recipe will be a favorite here in the house. I love cheesecake, and the chocolate with PB is a fave of everyone else. Will be a hit! Oh man, we used to make this when I was a kid, but I could never remember the recipe! Awesome. I love everything about this brownie! Peanut butter and chocolate is one of my favourite combos and cream cheese makes it so decadent too! Peanut butter and chocolate are a match from heaven — so I just know these over the top brownies are going to be a decadent treat! Yes, I am definitely with you, peanut butter and triple brownies ! These look so good! Three of my favorites combined into one delicious treat! I wish I could reach into my screen and grab one. 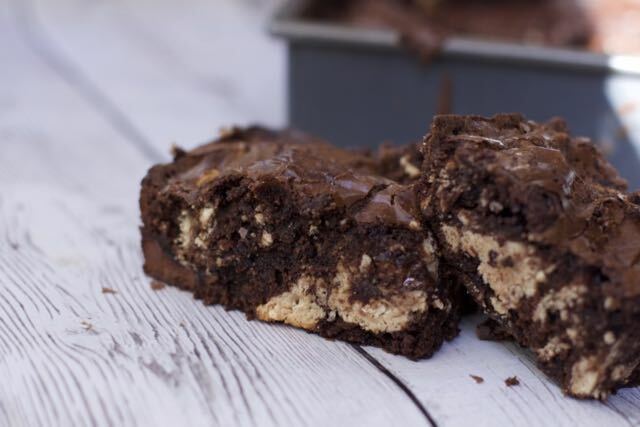 Peanut butter and cheesecake all in a brownie?! What an absolutely delicious dessert! I totally want to make some right now. Yummers!